A quality leather jacket is a staple of everyman’s well thought out wardrobe arsenal. There are many options depending on the look you desire. From motorcycle bad boy to old school aviator, there’s a leather jacket for you. If you often find yourself between purloining historical artifacts and going out for a night on the town with no time to change, the US Wings Signature Series Vintage Cowhide Indy-Style Adventurer Jacket might just be your new best friend. US Wings is based out of Hudson Ohio and has been in business since 1986. Started by Sgt. David Hack, a decorated soldier and successful recruiter (his recruiting Jeep is one of only 2 ever to be displayed in a US Military museum, the other belonging to Gen. George S. Patton) and his wife Lani Hack, US Wings is an official Defense Logistics Agency supplier and a supplier to US military and government agencies. But that doesn’t mean you need to drop and do 20 to have access to their great line up. In addition to their website, they operate a store in Hudson where they offer a full selection of military inspired jackets and casual everyday clothing. They even offer Tom Selleck’s Aloha Shirt as seen in Magnum P.I. which I’ve been eyeballing with unnatural fervor. The Indy Adventurer Jacket is part of US Wings Signature Series which means it’s handcrafted in the USA. This jacket is patterned after the original jacket worn by Harrison Ford in Indiana Jones which was originally designed by Neil Cooper (now US Wings). This jacket features 2 front button snap pockets with side entry hand warmers and an interior chest pocket. A heavy duty YKK zipper is used and protected by a wind flap with top and bottom snaps. Interior is lined with nylon which makes it comfortable against the skin and helps deal with perspiration. The large back panel is a testament to the quality of this jacket. Sometimes manufacturers cut costs by using smaller pieces of leather, often resulting in an unsightly seam going straight down the spine. The leather itself is vintage cowhide from the same tannery that supplied the leather for the 2008 Indiana Jones movie. Thick and substantial, the jacket is on the heavy side at roughly 4lbs 5oz. Even though the US Wings Indy Style Adventurer Jacket is modeled after a movie jacket, this is by no means a “costume piece” to be handled lightly. I found it to be a great option in moderately cooler temps. There’s not much insulation going on so be prepared to layer if it drops below 60 degrees. I took it to the beach and the windy conditions didn’t bother me at all. I wouldn’t recommend “popping” the collar for added protection though, unless you don’t mind resembling Dracula. The adjustable side straps keep the jacket secure and help keep out cold air. The Bi-swing back really gives you freedom of movement and offers an overall less constrictive feel. US Wings states this jacket is an “oversized fit” that runs about half a size large. I found this to be true, but since I’m between a L and XL I found it fit just right with enough room to layer without looking sloppy. Keep in mind the cuffs at the wrist do not have snap adjustments, while I would have liked to have had that option, I can understand the omission in keeping with the movie jacket design. All in all, you put the jacket on, and it doesn’t get in your way. This jacket’s strongest attribute is the classic styling. Essentially an A2 Bomber jacket minus the ribbed cuffs and hem. I’m usually wary about leather jackets as I feel they’re limited in versatility. However the Indy Style Adventurer looks good just about anywhere. Paired with some Levi’s, you look sharp but not too dressy. The side straps can be synched to give a more tapered look which I really appreciate. The large pieces of leather make for a clean and uncluttered garment. The pre-distressed leather exhibits beautiful graining with just the right scuffing. 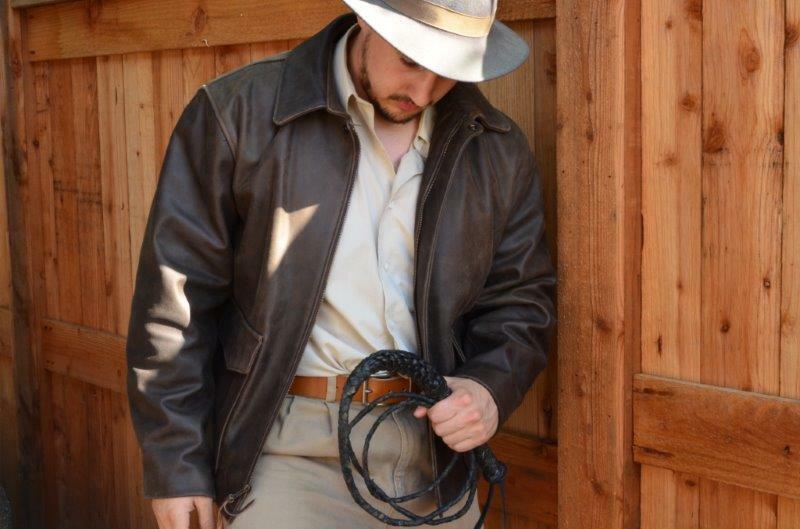 Of course I had to don the fedora and bullwhip just because this is first and foremost an Indiana Jones jacket! As much as I wanted to run amok in a Moroccan Bazaar, all I had was the local farmer’s market. At 489.00, the US WIngs Signature Series Vintage Cowhide Indy Style Adventurer Jacket is an investment that will serve you for a long time. The American made heritage and quality construction will prove to be a great asset to your wardrobe. Not to mention the origins of this jacket definitely conjure up a spirit of adventure whenever I throw it on, which will be quite often. 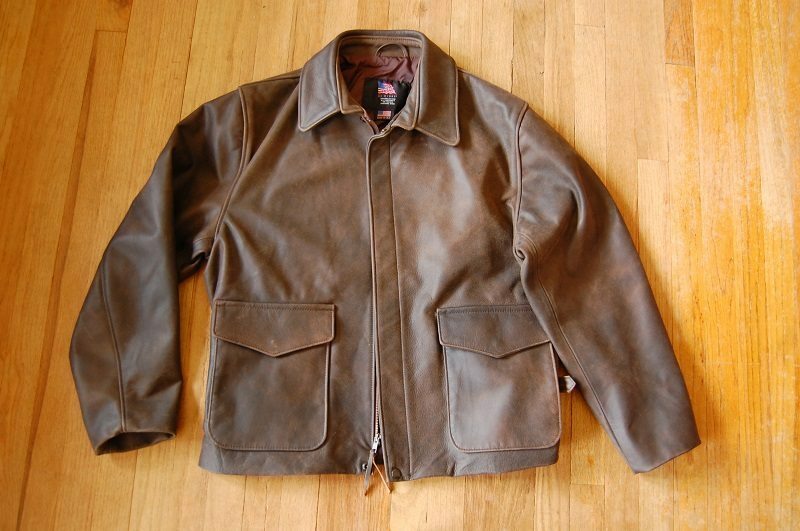 2 Comments on "US WINGS SIGNATURE SERIES VINTAGE COWHIDE INDY-STYLE ADVENTURER JACKET REVIEW – $489.00"